As East Bay Jews prepare for Passover, it's becoming harder to have peaceful discussions about Israeli politics. Protesters demonstrate against Israeli treatment of Palestinians. At Passover Seders next week, Jews throughout the East Bay and the nation will repeat the phrase, "Next year in Jerusalem." But actually having a civil discussion these days among Jews about Israel and its controversial policies toward Palestinians is growing increasingly difficult. "It's worse than it's ever been," said Rabbi Michael Lerner of Berkeley, explaining that he believes a heightened questioning of Israeli policies, both inside and outside the Jewish community, has put staunch supporters of Israel on the defensive. Now, Lerner said, one's intention in criticizing Israeli political decisions, even from people like himself who pray for Israel every day, is irrelevant. Instead of arguing with him, critics say, "You're destroying Israel." Lerner should know. The Tikkun magazine editor has received death threats and his home has been vandalized because of his views. Although few American Jews condone such acts of violence, many are nonetheless passionate about their defense of Israel, which they view as their sacred homeland. Dr. Michael Harris, a San Rafael pediatrician and founding steering committee member of San Francisco Voice for Israel, the Bay Area chapter of Los Angeles-based StandWithUs, points to the Jews' expulsion from Israel 2,000 years ago and their subsequent coherence as a people. "All Jews are part of one people," Harris explained. "We had a place; we had a nation; we were forcibly disbursed from that nation and for 2,000 years our religious and cultural life centered around a hope to return to that nation." But while Lerner supports Israel, he also strongly critiques it when its policies abuse the rights of Palestinians. Like Harris, he explains the Jewish psyche through history and suffering. "Jews have had 1,800 years of being thrown out of countries, stolen from, raped, murdered by their Christian neighbors, culminating in the mass murder of one out of every three Jews alive in the 20th century," he noted. "Jews are a traumatized people. ... The trauma is so deep that people don't feel secure in the United States." That trauma, Lerner said, has led to a blind spot for some who refuse to recognize the plight of Palestinians. "Jews had jumped from the burning buildings of Europe and landed on the backs of Palestinians," he said. "Our pain was so great that we couldn't see that we were inflicting pain on somebody else. And, in fact, we're outraged at anybody who'd dare suggest that we were inflicting pain on anybody else." Penny Rosenwasser of Oakland is a founding board member of Jewish Voice for Peace, an organization that calls for ending the Israeli occupation of the West Bank and Gaza Strip and for full equality for Palestinians. She says the antidote to the trauma Jews have suffered is facing the pain and fear, and refusing to act negatively on it. "The memory of Jewish suffering should link us to the plight of anyone who is oppressed," she said. "That means not bombing the Palestinians because of what the Nazis did to us and not projecting fear that is mostly historical persecution." Rosenwasser's passionate fight for Palestinian rights began with a discovery of her Jewishness when she was in her early thirties. She'd grown up celebrating Hanukkah and having a Christmas tree, and not connecting with the stories of the Jewish people she heard in Sunday school. In the early Eighties, Rosenwasser, a lesbian feminist, began attending Jewish women's conferences in the Bay Area that transformed her life. "There was this bond, this commonality, around being loud and having ideas and being smart and laughing and food and our feminism," she said. "Being leaders and speaking out for what we thought was right. It was a visceral feeling — a sense of belonging I had not felt." Like Rosenwasser, it was Michael Harris' heart that led him to take a stand on Israel, a stand diametrically opposed to hers. Harris grew up in a Zionist home in Philadelphia, but his feelings for Israel didn't fully emerge until his "life-changing" visit there as a college student in 1977. "It was an identification," he said, a recognition, "not from a religious viewpoint, but from a viewpoint of peoplehood, that this was a state of the Jewish people, that they had built this state, that they had developed it." And like Rosenwasser when she discovered the bond among Jewish women, Harris felt for the first time what it meant not to be different. "To go to a country, and suddenly, it's the country of your people; suddenly you're not a minority anymore," he said. "It changes the way you look at things." Harris' organizing efforts around Israel began in his religious congregation in Tiburon, which was already strongly pro-Israel. There, he didn't need to change minds, but worked to get people actively involved in supporting Israel. 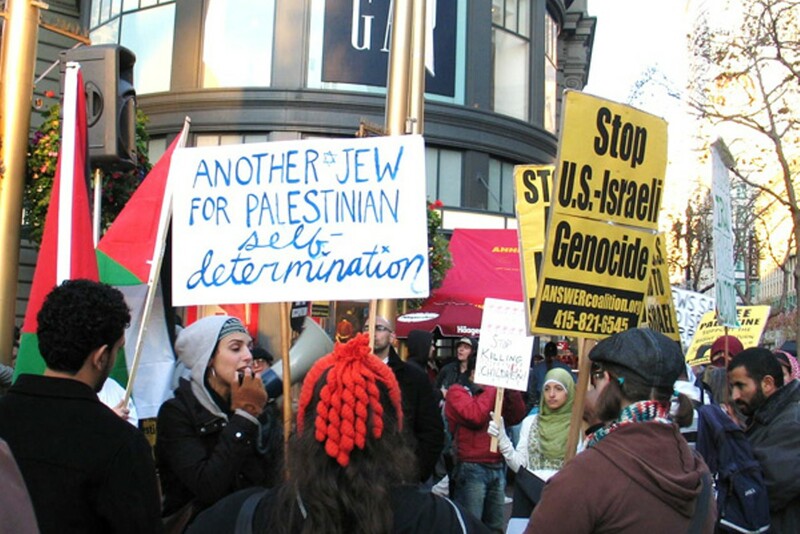 In 2003, at the time that the San Francisco Jewish Community Relations Council was bringing groups of Israeli supporters together, Harris said the anti-Iraq War rhetoric was becoming anti-Semitic. There was a "deliberate choice on the part of [anti-war rally organizer] International ANSWER to make as a prime focus the pro-Palestinian point of view as part of the movement against the war in Iraq." That linkage upset many Jewish anti-war activists, Harris said. And so, with the pro-Israel group that was already in formation, he helped found the San Francisco Voice for Israel to publicly oppose ANSWER's linkage between the anti-war and pro-Palestine movements. The Israel debate also often becomes charged with accusations of anti-Semitism against Israel's critics. Marshall Schwartz of Oakland, also a member of the SF Voice for Israel/StandWithUs steering committee, said he welcomes honest criticism of Israeli policies. But, he said that now "anti-Semitism masquerades as anti-Zionism." Schwartz says it's anti-Semitic when groups single out Israel for condemnation of human rights abuses while not addressing similar abuses from other Middle East countries. Calling Jewish Voice for Peace "slimy bastards," Schwartz contends "they will never ever open their mouths to criticize any Arab who represses the Palestinians." The fact that groups that claim to support the welfare of Palestinians "are so single-mindedly opposed to Israel and blinded to everything else is a complete confirmation of their anti-Semitism," he said. "They're not supporting peace; they're not supporting Palestinians; they're just out for the destruction of Israel. Period." Generally, the clash among Jews over Israel remains verbal. There was, however, a Jewish Voice for Peace meeting at the South Berkeley Senior Center last November, where the dissention spiraled out of control. Pro-Israel activists disrupted the meeting to protest an action the previous week where a group associated with Jewish Voice for Peace interrupted a speech by Israeli Prime Minister Benjamin Netanyahu in New Orleans. At the Berkeley meeting, Harris was among the protesters whom he described as "some associated with our organization and some not — all acting as individuals and not as part of any of the groups to which we belong." The protesters wanted to show Jewish Voice for Peace the futility of their actions in New Orleans, "to demonstrate how such tactics can be utilized by both sides of an issue and how [those tactics weren't] going to be a step towards resolving any differences," he said. The protesters read speeches loudly and one woman filmed the meeting. Harris said Jewish Voice for Peace members "wrested her camera from her hands." The Jewish Voice for Peace web site says its members "attempted to nonviolently block [the woman's] ability to aggressively videotape the faces of JVP meeting attendees against their will." The protester with the camera pepper sprayed two Jewish Voice for Peace members. Police were called, but no arrests were made. Rabbi Lerner, meanwhile, has been the target of a series of criminal acts. The incidents began last May, when Lerner announced that Tikkun would give its annual ethics award to Richard Goldstone, author of the UN report investigating the 2008-2009 Israeli assault on Gaza. "Goldstone shares the same perspective that I do, both critical of Israel and critical of Palestine," Lerner said. "He was being demeaned for the same reasons I am demeaned — for taking a middle path." The announcement was met by death threats that Lerner received by phone. "Shortly thereafter, my house was plastered with signs saying that I was a self-hating Jew," he said. Lerner's home was again targeted a few months later. A third incident at his home happened the day following the March 14 award ceremony for Goldstone that was also a celebration of Tikkun's 25th anniversary. "This time they put pictures of Nazis carrying off a Jew," Lerner said. One Nazi was labeled "Michael Lerner," and the other, a Muslim extremist. "This time worried me more than past times," he said. "When these right-wing extremists start to believe that I'm a Nazi, they believe that it's appropriate to kill Nazis." Berkeley police are investigating this third incident as a hate crime and Lerner said he plans to ask for FBI involvement. He underscored that he believes the incident was the work of an extremist group and does not blame the Zionist community. He added that he sees the perpetrators as wounded people, victims of historical trauma. "I pray to God for forgiveness of the people who attacked my home," he said.